We work on almost every make and model of car. It will have to be something exceptional for us not to be able to service, fix or repair your brakes. And we do everything. We supply and fit brake pads for all standard situations and we also deal with custom cars. If your vehicle requires a special type of brake pad, we are experienced and expert in these situations. 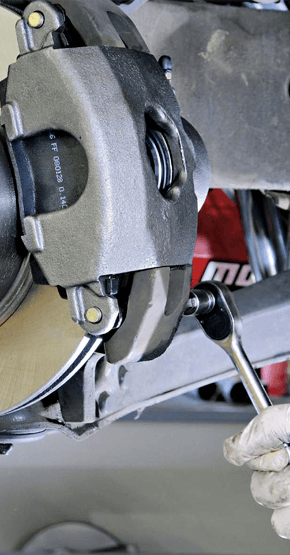 We can tackle your brakes from a basic check and replacement right through to a full brake rebuild. If you require disc and drum machining, we can provide that service to the highest standards. Regular maintenance of your vehicle and especially its braking system is the best way to keep you on the road, driving safely and at the lowest possible cost. One of your major benefits is that we operate at all levels for all vehicles. Standard but the best service is our bread and butter but if you require custom braided brake upgrades, that too is a service we confidently supply. We offer all types of brake and disc services and always to the highest quality. We are the South Australian agent for QFM brake pads and street legal stainless steel braided hoses. We provide only the best spare parts available giving you the best of both worlds – expert mechanics and top quality materials.